Beauty Costs > Nails > How Much Does Nail Polish Cost? How Much Does Nail Polish Cost? Most women (and some men) choose to wear nail polish on a daily basis. The cost of nail polish will vary depending on a few things such as the brand, the type of polish as well as how many are going to come included the set. On average, nail polish is going to cost anywhere from $2 to as much as $25 per bottle. This will greatly depend on the brand, the quality of the nail polish as well as other various factors. A 6 color set of Kleancolor Neon Nails , for example, will cost anywhere from $9 to $25 a set. The company — Kleancolor — also has many other sets that have different colors. Each set will vary anywhere from $10 to $30. A popular brand online, such as the OPI Lincoln Park after Dark, will cost anywhere from $5 to $9 new. For a larger set of 20 or more, the brand BCC has a set that ranges anywhere from $30 to as much as $130. LA Colors has a larger set that includes more than 24 sets, and this kit will cost anywhere from $50 to $125. Storing more than one polish may get tricky. 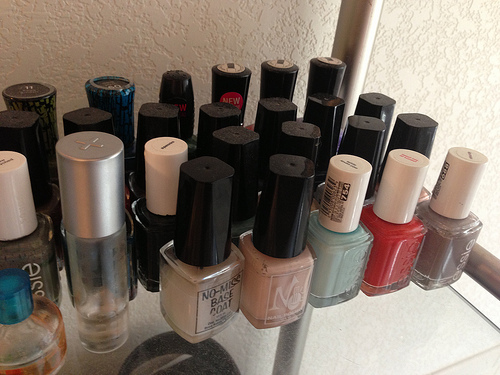 A rack may be required in order to keep your polish organized at home. Before doing your nails, it’s best to apply a polish remover to ensure that any of the old nail polish is removed. It also prepares the nails so that the new polish can be applied to the nails. It’s best to wear gloves when doing dishes or heavy household around the house. By doing this, it’s going to prevent damage to your nails. Consider going to local beauty shops as many have a try it before you buy it type deal. This is a great way to see how the nail polish is going to look on your hands before purchasing. Base coats are going to dry faster, while a top coat is going to look shiny. If your nail polish tends to bubble up, this is a sign of an insufficient drying time. To avoid bubbles in the future, be sure to allow adequate drying time in between coats. Experts recommend a UV light dryer to properly dry the nails. Don’t be too cheap with your nail polish. Cheaper nail polish will take longer to dry, the brush can be low in quality, the paint can be cheap and the bottle may cost more than you think. That’s why it’s best to pay close attention to the fluid ounces on the bottle to know exactly how much you’re getting. Consider purchasing your polish in bulk. The more you purchase, the more you’re going to be able to save. Online purchases are usually cheaper than those in your local beauty store. Check out prices on various online websites such as Amazon before paying in person.